Remember that girl in high school that had the incredibly beautiful Farrah Fawcett haircut, complete with feathers and blonde highlights? You coveted her look every day of the week. Now, isn’t it funny, how at your 20 year reunion you were able to pick her out of the crowd because her hair style had not changed a bit making her look dated and old? And what about the popular boy you went to high school with – the first guy brave enough to get the mullet? If he is still a Joe Dirt, Billy Ray Cyrus look alike chances are he isn’t quite as popular now as he was back then. Let’s face it people, at some point modernizing your haircut is an important step to take in keeping up with your personal appearance. Just like styles of clothing and shoes change from year to year and decade to decade, so do hairstyles. Many people (both men and women) get so stuck on a hairstyle that they become anxious about the sheer thought of changing it. So each and every time they go to a hairdresser, they stick with the simple cut and trim which does little to update their look and sense of personal style. One of the most common fears of women is the fear of changing their hair. Hair style experts from Lifetime Television recommend that women consider hair style and color changes about once every two years in order to keep up to date and their appearances fresh. Yet, for many people the thought of cutting off long locks, or straying from what they have dubbed comfortable causes an irrational sense of fear. In the show, What Not to Wear, stylists face this challenge with people in nearly every episode. Despite the fact that the many of the women on the show have outdated, unhealthy and essentially unattractive hair – they cling to the color or style. In a survey conducted by the hit show, it was estimated that around 83% of all the makeover participants went back to their original hairstyle within one year after the show. This is despite the fact that friends and family (as well as millions of television viewers) agreed that they looked better in their after photos. Some of the reasons that many people are afraid to change their hair is because they have become so comfortable with their hairstyle. Remember your Farrah Fawcett look-alike high school pal. Chances are that for many years she was complimented because of her hair and shiny frock. With so much acceptance coming from so many directions, the hairstyle became part of her identity. So changing it in her eyes, would diminish her sense of self confidence and beauty. Hair experts also suggest that many people are afraid of modernizing their hairstyles because they have an irrational sense that the haircut would be irreversible. Even though we all know that hair grows back, the assumed feeling that we won’t like what we see in the mirror is enough to keep people clinging to their dated looks. Of course, another reason that people are afraid to update their hair is because they seek approval from others and worry that once the hair is transformed they will not receive it. 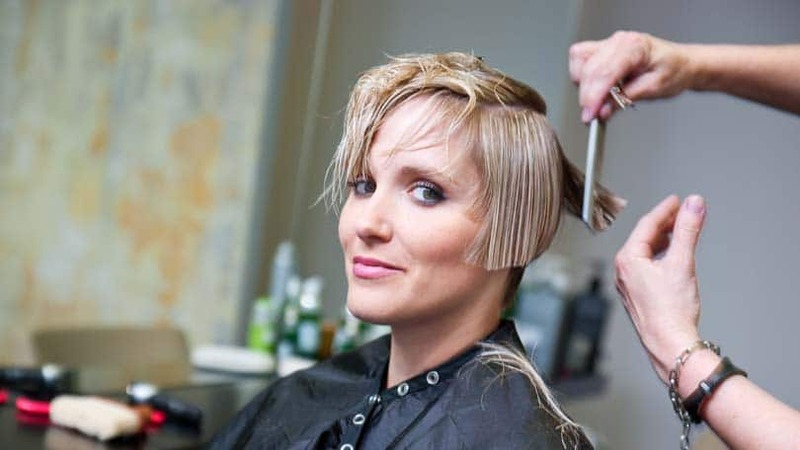 There have been millions of women who have sat in haircutting chairs and said, “My husband will kill me if I cut my hair!” And the fear that he will no longer find her attractive after a hair cut, becomes enough to keep their look in a time capsule. What many people fail to realize is that changing your hair is one of the easiest, and most transformational ways to change your overall appearance. Sometimes, a hint of color, some high lights – or a fresher look can not just make your hair healthier, but can also make you look younger. The key in changing your hair style, especially if you are hesitant is to make small changes a little at a time. If you have always had long, Marilyn Monroe blonde hair – then start with getting a few inches cut off the back or the addition of some layers. This gives you time to adjust to a new style that is not so drastic from what you had before. Experts do not recommend that people with anxiety about changing their hair go for drastic changes right out of the gate. Additionally, use some of the software available online and at many beauty shops that can take a picture of you and give you new hairstyles on the computer so you can get a chance to see your ‘new self’ before actually taking the plunge. Hair stylists encourage their clients to bring in pictures of hair cuts that they like. Yet, they also warn clients that not every hairstyle works for every face shape and hair type. While you may love the look of one celebrity’s hair, the look and cut may not do anything to enhance your own natural beauty. Far too many people come into beauty shops with an unreasonable expectation of a hair cut. Bottom line, if you didn’t look like Demi Moore beforehand, a hair cut isn’t going to turn you into her twin sister afterwards. A bad hairstyle can make you look dated. And old. Remember that for years and years, the trend in women’s make-up was to wear blue eye shadow and blue eyeliner no matter what color your eyes were. Today, that trend (while popular on the runway) is reserved for cross dressing drag queens. Don’t be afraid to take a leap forward, to make a personal change with your hairstyle or color. You never know, the NEW you might be more well received and more attractive than the old you.